I recently tasted some honey from a local Edmonton beekeeper using a Flow Hive. If you’re not familiar, the Flow Hive is a new type of beehive design that started making the rounds on social media about a year ago when the company launched its Indiegogo campaign. 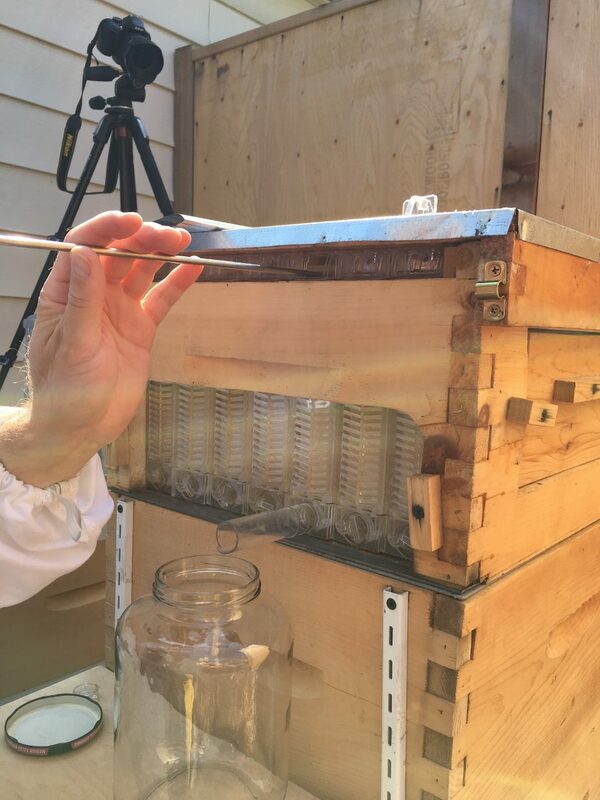 The Flow Hive offers a new way of extracting honey. The Flow frames are made of plastic cells that the bees fill with honey as usual. To harvest, a key (like a long Allen key, essentially) is inserted into a mechanism on the frame and turned, which causes the cells to split apart and all the honey inside to drain out through a tube inserted at the bottom of the frame. No filters are needed and there’s no messing around with honey extractors, slicing off wax caps, and the normal laborious, messy honey harvesting process. The Flow Hive is insanely successful – it became the largest international campaign ever on Indiegogo, surpassing its goal of $70,000 USD in less than 10 minutes and raising $2.1 million in a single day, setting a record for the most funds raised in 24 hours. All told, the campaign raised over $13 million USD. Intrigued by the new design, Carl Loeffelman purchased some Flow Hive frames for his backyard hive in Edmonton’s Holyrood neighbourhood. He and his partner Sylvia Van Os are new beekeepers: they just got their first hive in April this year. They’re using standard Langstroth hive boxes, with the addition of a honey super containing seven Flow Hive frames. 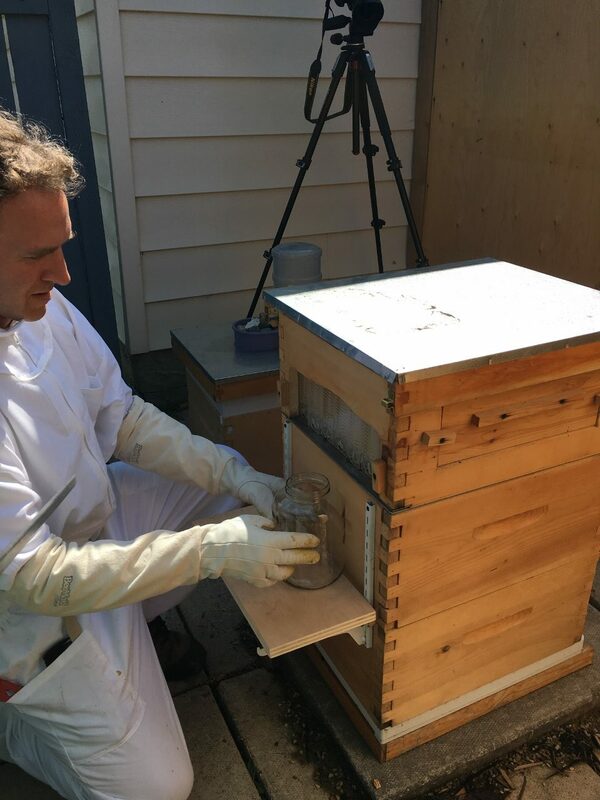 Carl modified a regular Langstroth hive box to fit the Flow frames. A queen extractor is used to keep the queen from laying any brood in the honey super. Mess: The Flow Hive reduces the mess involved with honey extracting, but doesn’t solve it completely – some of the honey leaked out the bottom of the frames and dripped down the inside of the hive. This covers the brood and bees underneath in honey, and also drips out the screened bottom board and attracts beehive pests like ants and wasps. Next time they harvest, Carl and Sylvia plan to solve this by removing the honey super and setting it over top of something to catch that excess honey while it drains, and keeping the rest of the hive clean. Robbing: As we were standing there watching the honey drain, a wasp dive-bombed right into the open jar of honey. Carl and Sylvia have come up with a quick solution to this: cover the jar and drainage tube with tinfoil while it’s in operation. Expense: Carl paid about $400 USD for seven Flow Hive frames. The full Flow Hive setup costs just over $600 USD. In comparison, you can buy a standard Langstroth hive locally for about $500 CAD. Honey extractors, however, are quite expensive – about $500 or $600. So while the Flow Hive is expensive at first glance, beekeeping costs add up regardless of what design you’re using. The Flow Hive founders, to their credit, have really worked on changing the way their invention is being marketed. I strong recommend you visit their website, as it has lots of resources for showing the hive in action, as well as resources on responsible beekeeping. I also really like this story in Modern Farmer featuring an interview with Flow Hive founder Cedar Anderson, which is one of the most balanced pieces on the Flow Hive that I’ve read yet. So, the Flow Hive seems a bit gimmicky and geared towards inexperienced, hobby and/or urban beekeepers. While I’ve generally found the local Edmonton beekeeping community to be fairly welcoming, I’ve also noticed some gatekeeping and low-key animosity from veteran and professional/semi-professional beekeepers. I get it: they are protecting their trade, and the Flow Hive seems like a direct threat to their livelihood. It also came off like another annoying, trendy, hipster millennial invention bursting onto the scene of a trade that’s thousands of years old and still pretty low-tech. Also, I’m sure a lot of condemnation came from people who didn’t have any personal experience with the Flow Hive and hadn’t done much research other than watching a snippet of a YouTube video posted on their Facebook wall. All that being said, the Flow Hive is a new but already permanent part of the beekeeping landscape, so we’re all going to have to live with it. I’m a lot more OK with it now, having seen it in action. But I also recognize its problems and it’s certainly not for everyone. I would also be very surprised if it ever scaled up and became the default method for the commercial honey industry – it would take many years and great expense to replace all of the commercial beekeeping infrastructure out there. I see the Flow Hive as just another tool in the beekeeper’s tool belt, take it or leave it. Personally, I could see myself having a single box of Flow frames just for ease of honey extraction – the same setup that Carl and Sylvia have. And now for the most important question – what did the Flow Hive honey taste like? Clean, lightly aromatic, a lovely viscous mouthfeel and a hint of warm baking spice on the back palate. It was rather neutral, actually – a honey that tasted simply like honey. The older sample had a bit more spice on the back palate; Carl and Sylvia thought it might be from all the Japanese lilacs that were blooming at the time. The Flow Hive honey was a dead ringer for commercial honey, quite frankly. I find this interesting because it could offer people a raw, natural alternative to pasteurized, processed commercial honey, which is great. Also, a lot of people aren’t used to honey that’s very strongly-flavoured, which a lot of the local stuff is. Maybe it could be a gateway for people to start exploring the world of local/raw honey. Tasting the Flow honey made it very clear that a significant part of the terroir of honey is the wax honeycomb. I had noticed this already after tasting the brown, toffee-flavoured honey from a wild hive. The Flow honey was the complete opposite of this. The Flow hive’s plastic cells mean that you aren’t getting other flavours imparted to the honey from natural wax. I didn’t notice any plastic-y flavours in the Flow honey, which is good; it just tasted very neutral. So again, this makes it appealing to those looking for something akin to what you’d pick up at the grocery store. I hope more people continue to experiment with Flow Hives. They make a lot of sense for small-scale beekeepers as an alternative to buying a honey extractor. They aren’t perfect, for sure. But it still seems like something that should be considered, rather than rejected outright on principle (or personal emotion) alone. I’m also looking forward to continue tasting honey from Edmonton’s local hives, whatever their design, so if you’d like to have me check out your honey and write up some tasting notes, please get in touch.